Gordon Bitner Hinckley (June 23, 1910 – January 27, 2008) was an American religious leader and author who served as the 15th President of The Church of Jesus Christ of Latter-day Saints (LDS Church) from March 12, 1995, until his death. Considered a prophet, seer, and revelator by church members, Hinckley was the oldest person to preside over the church in its history. Hinckley's presidency was noted for the building of temples, with more than half of existing temples being built under his leadership. He also oversaw the reconstruction of the Nauvoo Illinois Temple and the building of the 21,000 seat Conference Center. During his tenure, "The Family: A Proclamation to the World" was issued and the Perpetual Education Fund was established. At the time of his death, approximately one-third of the church's membership had joined the church under Hinckley's leadership. Hinckley was awarded ten honorary doctorate degrees, and in 2004, he was awarded the Presidential Medal of Freedom by George W. Bush. Hinckley also received the Boy Scouts of America's highest award, the Silver Buffalo, and served as chairman of the Church Boards of Trustees/Education. Hinckley died of natural causes on January 27, 2008. His wife, Marjorie Pay, died in 2004. He was succeeded as church president by Thomas S. Monson, who had served as his first counselor in the First Presidency, and, more importantly, was the President of the Quorum of the Twelve Apostles; therefore, according to LDS doctrine and practice, Monson was Hinckley's anticipated successor. The child of a multi-generational Latter-day Saint, Hinckley was born in Salt Lake City, Utah, to prominent LDS writer and educator Bryant S. Hinckley and Ada Bitner Hinckley. He graduated from LDS High School in 1928. He grew up on a residential farm in East Millcreek. His home library contained approximately a thousand volumes of literary, philosophical and historical works. Hinckley was known for his optimism and plain-speaking. Hinckley attended the University of Utah, where he earned an undergraduate degree in English, and minored in ancient languages. He studied Latin and could read ancient Greek. Hinckley became a missionary for the LDS Church, an unusual occurrence for Depression-era Latter-day Saints. He served in the London-based British Mission from 1933 to 1935. He would later write the words for LDS hymn no. 135, "My Redeemer Lives". Hinckley returned to the United States in 1935 after completing a short tour of the European continent, including preaching in both Berlin and Paris. He was given an assignment by his mission president, Joseph F. Merrill, to meet with the church's First Presidency and request that better materials be made available to missionaries for proselytizing. As a result of this meeting, Hinckley received employment as executive secretary of the church's Radio, Publicity and Missionary Literature Committee (he had received schooling as a journalist in college). Hinckley's responsibilities included developing the church's fledgling radio broadcasts and making use of the era's new communication technologies. One of the projects Hinckley oversaw in the late 1930s was development of the church's exhibit for the Golden Gate International Exposition. In 1935 Hinckley also worked as a seminary teacher for the LDS Church. He however decided to focus solely on the work with the Radio, Publicity and missionary literature committee. Starting in 1937, he served on the Sunday School General Board. After the Second World War, during which he left full-time LDS Church employ to work for a time with the Rio Grande Western Railroad, Hinckley served as executive secretary to the church's Missionary Committee. He also served as the church's liaison to Deseret Book, working with Deseret Book's liaison to the church, Thomas S. Monson. At various times, especially in the late 1940s, Hinckley was also a reporter for the Church News, a publication of the Deseret News. In the early 1950s, Hinckley was part of a committee that considered how to present the temple ordinances at the Swiss Temple. The concern was how this could be done when a need existed to provide them in at least 10 languages; the concern was eventually solved through the use of a film version of the endowment. Hinckley's background in journalism and public relations prepared him well to preside over the church during a time when it has received increasing media coverage. In 1957, Hinckley was named to the board of directors of KSL. Shortly after he was named to the executive committee of the board. On April 29, 1937, Hinckley married Marjorie Pay (November 23, 1911 – April 6, 2004) in the Salt Lake Temple. They had five children, including Richard G. Hinckley, an LDS Church general authority since 2005, and Virginia Hinckley Pearce, a former member of the church's Young Women general presidency. Another of their daughters, Kathleen Hinckley Barnes Walker, co-authored several books with Virginia, and ran an events company. Her first husband, Alan Barnes, died in 2001 and in 2004 she married M. Richard Walker. The Walkers served from 2005 to 2008 as president and matron of the Salt Lake Temple and lived in Preston, England, from 2011 to 2013, while Richard served as president of the Missionary Training Center. Hinckley's other son, Clark, has also served in several church leadership positions, including stake president, as president of the church's Spain Barcelona Mission (2009 to 2012), and since December 2015 as the first president of the Tijuana Mexico Temple. After returning to East Millcreek at the end of employment with the railroad, Hinckley was called as a counselor in the presidency of the church's East Millcreek Stake. He later served as president of that stake, until about six months after his call as an Assistant to the Quorum of the Twelve Apostles. During his time as stake president Hinckley oversaw the building of several chapels. In the April 1958 general conference, Hinckley became a church general authority as an Assistant to the Quorum of the Twelve Apostles, a position that was later discontinued. One of his first assignments as a general authority was participating in the dedication the same month of the New Zealand Temple. In August 1958, Hinckley traveled to England where he was involved in the London Temple open house and dedication. As a general authority, Hinckley continued to work with the missionary department, and after the death of Richards worked closely with Henry D. Moyle. In early 1960, Hinckley was given responsibility for overseeing LDS Church operations in Asia. His first trip there in the spring of 1960 lasted two months and involved going to Japan, Hong Kong, Taiwan, South Korea and the Philippines. In the Philippines, he worked on getting government approval for missionaries to be sent. He returned to Asia on a second trip in April 1961, which included a meeting to inaugurate missionary work in the Philippines. During this trip he also was in Seoul, South Korea during the May 16 coup. Hinckley wired a story on the coup to the Deseret News. In June 1961, Hinckley was one of the general authority presenters at the first Missionary President training seminar, and was involved in the presentation of the first standardized missionary lesson plan. In September 1961, Hinckley became an apostle in the Quorum of the Twelve Apostles. He filled a vacancy created by Hugh B. Brown being added to the First Presidency as the third counselor to David O. McKay. After his call as an apostle, Hinckley continued to be a leader in the missionary department, with Boyd K. Packer serving as one of his key aides. Hinckley was also appointed the chair of the all-church coordinating council's children's section. Hinckley also continued to oversee the church's operations in Asia. In February 1962, he made the first trip to Asia on which he was accompanied by his wife, Marjorie. On this trip they visited the Philippines, Hong Kong, Taiwan, Japan and South Korea On his return he held training seminars with missionaries in California and Illinois in cooperation with Moyle, and later held training seminars in all 23 missions in Europe. These seminars were credited with being the main force behind higher rates of conversion over the coming summer. Also in 1962 Hinckley was involved in the negotiations which lead to the LDS Church purchasing the shortwave radio station WRUL. During this time, Hinckley also dedicated a chapel in French Polynesia on the island of Huahine. A group of Latter-day Saints returned to their home island on their boat which sank with 15 drowning. Hinckley cancelled his return to Utah and took a voyage on a sailing vessel to preside at the funeral. In late 1963, Hinckley made another tour of the Philippines, Japan and South Korea, this time not only bringing his wife but their ten-year-old daughter as well. In the spring of 1964, the Improvement Era published a series or articles on the church in Asia, where it identified Hinckley as president of the "Hawaiian-Oriental Missions". In 1964, Hinckley was appointed a board member of KIRO-TV and KIRO-AM/FM which the LDS Church had just purchased. When the church formed Bonneville International Corporation later in 1964 Hinckley was named a vice president, a member of the board of directors and a member of the executive committee. Hinckley circumnavigated the world on a trip with his wife in late 1964. First he stopped in Tokyo for a missionary conference. He then traveled to South Korea, Hong Kong and the Philippines as he had before. Next he went to Thailand and held a meeting with the few church members, all expatriates, in that country at the time. Hinckley then traveled to Saigon and met with about 60 church members, mostly American military personnel. There were two Vietnamese citizens who had joined the LDS Church at the meeting in Saigon. Finally, he visited Singapore and then went to India. In India he went to Madras and then Coimbatore. At the later location, Hinckley met with Paul Thirithuvodoss who had written to LDS Church headquarters asking for baptism. Hinckley went to Medukerai to see a school run by Thirithuvodoss. Hinckley decided not to baptize Thirithuvodoss at that time. The Hinckleys then traveled to Beirut where they met with a small group of church members and then on to Jerusalem. From there, they traveled to Greece where they met with another small group of church members. They then proceeded to Frankfurt, where they stayed in the home of Ezra Taft Benson and his wife, Flora. Benson was then presiding over the European Mission, and then the Hinckleys went to Brussels before returning to Utah. In July 1965, Hinckley went to Hawaii where he was involved with the first LDS temple services done in Japanese. Also in 1965, Hinckley was involved in negotiations with United States Selective Service officials that lead to the establishment of a quota of one LDS missionary, who would otherwise be drafted, being able to leave from a ward or branch every six months, with the quota transferable within any given LDS district or stake. In the late 1960s, Hinckley was a key person in formulating official LDS Church statements, such as the 1968 statement on the sale of liquor by the drink. In the early 1970s, Hinckley served as chair of the executive committee of the Church Board of Education. Beginning in 1972, Hinckley was as the initial head of the LDS Church's public affairs department. In September 1972, Hinckley and his wife traveled with church president Harold B. Lee and his wife Joan, on a tour of the United Kingdom, Greece, Israel and Italy. The visit included meetings with church members in Rome, a group of LDS youth at an event at the Santa Severa resort on the coast of the Tyrrhenian Sea, and meetings with Church members in Florence, Pisa and Milan. In Milan they held a press conference, which was only attended by one journalist, Michele Straniero, who interviewed Lee and Hinckley for an hour and not only published work in La Stampa from this interview, but used it as the starting point to a book on Mormonism he later wrote. Also in the 1970s, Hinckley had supervisory assignments for the church in South America and later in Europe. He served on the church's executive committees for temples, missionary work, welfare services, priesthood and the military. Hinckley was the chair of the executive committee over the 1980 commemoration of the 150th anniversary of the organization of the LDS Church. On July 23, 1981, Spencer W. Kimball appointed Hinckley as a counselor in the First Presidency. After first counselor N. Eldon Tanner died in 1982, Kimball did not appoint a new counselor. As the 1980s progressed, more of the day-to-day affairs of the First Presidency fell to the healthier Hinckley. By 1984, Hinckley was the only publicly active member of the First Presidency. In 1984, the church formed Area Presidencies. Before Area Presidencies, church headquarters administered national and multi-national areas. The Area Presidencies decentralized administration with presidencies living in locations around the world. During his time in Kimball's presidency, Hinckley presided over the dedication of 16 LDS temples. Among them was the Manila Philippines Temple. Hinckley dedicated it 18 years after he dedicated the first Philippine LDS chapel. At the time of Kimball's death, Hinckley had dedicated nearly half of the then 36 temples. After Kimball's death in November 1985, Ezra Taft Benson became President of the Church. Benson named Hinckley as first counselor and Thomas S. Monson as second counselor. In the early 1990s, Benson developed serious health problems, removing him from public view. Hinckley and Monson carried out many of the duties of the First Presidency until Benson died in 1994. During the presidencies of Kimball and Benson, most of the new temples dedicated were dedicated by Hinckley. When Benson died in 1994, about half of all operating temples had been dedicated by Hinckley. The Mark Hofmann document forgeries, bombings, and investigation occurred during this time. "The news interest was global" and "the whole episode achieved epic proportions." Several books describe the acquisition of supposed historical documents by Hinckley and others. For example, the secret sale of the Stowell document describing Joseph Smith's "money-digging pursuits." Using $15,000 of Church funds, Hinckley bought the document from Hofmann. Two years later, Hofmann leaked its existence to the Mormon history community. Upon press inquiries, Hinckley acknowledged the document and released it. Later, bombing investigators proved Hofmann forged the document. In 1992 Hinckley made an official visit to Rome where he presented a copy of the Encyclopedia of Mormonism to the Vatican. After Benson's death, Howard W. Hunter became President and retained Hinckley and Monson as counselors in the First Presidency. With Hunter as President of the Church, the title of President of the Quorum of the Twelve Apostles fell to Hinckley per the tradition of seniority. Hinckley and his counselors meet with George W. Bush, August 31, 2006, in the Church Administration Building in Salt Lake City, Utah. When Hunter died after a presidency of nine months, Hinckley succeeded to the presidency of the church at the age of 84, on March 12, 1995. Hinckley immediately showed a change in approach and tone from his predecessors by making the meeting with the press where his call was announced into an actual press conference where reporters were invited to ask questions. This sent the reporters scrambling to try and figure out what to actually ask. On November 2, 2006, Hinckley surpassed David O. McKay to become the oldest LDS Church president in history. Hinckley was known for accelerating the building of temples. When he became president, there were 47 operating temples in the church; at the time of his death, there were 124, over two-thirds of which had been dedicated or rededicated under Hinckley, with 14 others announced or under construction. Hinckley oversaw other significant building projects, including the construction of the Conference Center and extensive renovations of the Salt Lake Tabernacle. On September 23, 1995, Hinckley released "The Family: A Proclamation to the World", a statement of belief and counsel regarding the sanctity of the family and marriage prepared by the First Presidency and Quorum of the Twelve. In February 1996, church membership in countries other than the United States surpassed that of the U.S. Also in 1996, 60 Minutes aired an interview of Hinckley by Mike Wallace during a segment on the LDS Church. In 1998, Hinckley was a guest on CNN's Larry King Live. Hinckley maintained a friendship with both Wallace and King until his death. In November 2000, Hinckley spoke to the youth of the church and gave them six traits to work on, named the "Six Be's" (Be Grateful, Be Smart, Be Clean, Be True, Be Humble, Be Prayerful), which were first introduced in his New York Times Bestseller Standing for Something and later expanded on in Way to Be. On March 31, 2001, Hinckley announced the creation of the Perpetual Education Fund, an endowment that provides loans to students in developing nations. On October 22, 2002, Hinckley participated in the dedication of the Gordon B. Hinckley Building at Brigham Young University–Idaho in Rexburg, Idaho. This was the first building at BYU–Idaho to be named for a living church president. In April 2003, Hinckley gave a sermon that addressed the ongoing War in Afghanistan and the Iraq War, which had started just two weeks earlier. He said, "as citizens we are all under the direction of our respective national leaders. They have access to greater political and military intelligence than do the people generally," adding, "[f]urthermore, we are a freedom-loving people, committed to the defense of liberty wherever it is in jeopardy." He also noted that "[i]t may even be that [the Lord] will hold us responsible if we try to impede or hedge up the way of those who are involved in a contest with forces of evil and repression." In March 2005, Hinckley, together with Thomas S. Monson and James E. Faust, celebrated their tenth anniversary as the First Presidency—the first time in the history of the church that a First Presidency had continued for such a period of time without personnel changes. On January 24, 2006, Hinckley underwent surgery to remove cancerous growths from his large intestine. He was also diagnosed with diabetes at that time. In June 2006, Hinckley traveled to Iowa City, Iowa, to speak at a commemoration of the 150th anniversary of the start of the Mormon handcart companies. On June 23, 2006 (his 96th birthday), Hinckley participated in a groundbreaking ceremony at Brigham Young University (BYU) in Provo, Utah, for a new building that was to be named in his honor. 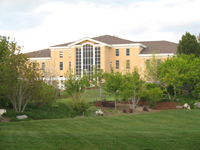 The building was named the Gordon B. Hinckley Alumni and Visitors Center and was completed and dedicated on Hinckley's 97th birthday. On March 31, 2007, Hinckley rededicated the Salt Lake Tabernacle after extensive renovation. Hinckley's last public appearance was on January 4, 2008, when he offered the prayer at the rededication of the Utah State Capitol. During his tenure as president, Hinckley gave over 2,000 speeches; he traveled nearly a million miles over a lifetime to more than 160 countries, as he met with church members and dedicated meetinghouses and temples. Hinckley's annual speeches at BYU were the subject of a study by the National Center for Voice and Speech at the University of Utah to analyze how the human voice changes with age. Thirty-six speeches by Hinckley were analyzed, ranging from 1958, when he was 47-48, to 2007, the year prior to his death. The study showed how his voice started dropping in pitch in his 50s and continued until he was 70, after which he began to develop a higher, thinner "old person" voice. By his 80s, his voice became increasingly wavery and the rate of his speech began to slow and by his 90s, he would slur words. Hinckley was a good subject for the study as the annual addresses were meticulously recorded and transcribed, in addition he did not smoke, drink, sing, or engage in other activities that would put unnatural strain on his voice. At the time Hinckley became president of the church, he had dedicated 23 of the church's 47 temples and had rededicated four of the remaining 24. While president of the church, Hinckley presided at the dedication of 65 additional temples. Hinckley also rededicated five temples while president of the church, four of which he had dedicated initially. In all, Hinckley dedicated or rededicated 92 different temples—70 as president of the church—at 97 different dedicatory services. 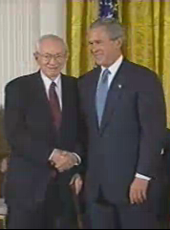 On June 23, 2004 (Hinckley's 94th birthday), U.S. President George W. Bush awarded Hinckley the Presidential Medal of Freedom in a ceremony at the White House. The press release put forth by the White House stated: "Gordon B. Hinckley ... has inspired millions and has led efforts to improve humanitarian aid, disaster relief, and education funding across the globe." Hinckley received many educational honors, including the Distinguished Citizen Award from Southern Utah University, Distinguished Alumni Award from the University of Utah, and 10 honorary doctorates from schools including Westminster College, Utah State University, Utah Valley University, University of Utah, Brigham Young University, Brigham Young University–Idaho, Weber State University, and Southern Utah University. He received the Silver Buffalo Award, which is the highest honor bestowed by the Boy Scouts of America, and was honored by the National Conference for Community and Justice for his contributions to tolerance and understanding in the world. On January 27, 2008, Hinckley died at the age of 97 while surrounded by family in his Salt Lake City apartment. According to a church spokesman, the death was due to "causes incident to age." The Deseret Morning News reported that Hinckley had just gone through a treatment of chemotherapy a few days earlier, and had "worked until the very end." The day following Hinckley's death, thousands of LDS youth in six states organized a social network campaign to dress in "Sunday Best" to honor Hinckley. Funeral services were held on February 2, 2008, at the Conference Center in Salt Lake City, which was attended by tens of thousands. Hinckley was buried at the Salt Lake City Cemetery next to his wife, who had died almost four years earlier. Some of the soil that was used to bury him was imported from the grounds of the Preston England Temple in Lancashire; this was done because Hinckley had been a missionary in this region of England. Hinckley was succeeded as president by Thomas S. Monson on February 3, 2008. In 2012, a 50-year longitudinal study of the development of Hinckley's voice, based on addresses he gave at BYU, was published in the Journal of the American Geriatrics Society. The study gave insight into the changes in the voices of aging adults. Hinckley, Gordon B. (2016). Teachings of Presidents of the Church: Gordon B. Hinckley. LDS Church. LDS Church publication number 08862. —— (2001). "Truth Restored: A Short History of the Church of Jesus Christ of Latter-day Saints" (Revised ed.). LDS Church. OCLC 49300018 . Reprint in part of What of the Mormons? —— (2001). Walking in the Light of the Lord: A Message for Mothers. Eagle Gate. ISBN 978-1-57345-979-2. —— (1973). From My Generation to Yours, With Love. Deseret Book. ISBN 0-87747-512-1. ^ a b c d 2008 Deseret Morning News Church Almanac (Salt Lake City, Utah: Deseret Morning News, 2007) pp. 507–08. ^ Dew, Sheri L. (22 January 1996). "Go Forward with Faith: The Biography of Gordon B. Hinckley". Deseret Book Company – via Google Books. ^ "The life of President Gordon B. Hinckley", Deseret News, January 28, 2008. ^ My Redeemer Lives", hymn no. 135, Hymns of The Church of Jesus Christ of Latter-day Saints (Salt Lake City, Utah: LDS Church, 1985). ^ a b Dew, Sheri L. (1996). Go Forward with Faith: The Biography of Gordon B. Hinckley. Salt Lake City, Utah: Deseret Book. pp. 304, 395–401. ISBN 1-57345-165-7. ^ Gary Bergera. "Gordon B. Hinckley" in Ardis E. Parshall and W. Paul Reeve ed, Mormonism: A Historical Encyclopedia, p. 145. ^ Robert I.Eaton and Henry J. Eyring. I Will Lead You Along: The Life of Henry B. Eyring. Salt Lake City: Deseret Book, 2013. p. 206. ^ James A. Toronto, Eric R. Dursteler and Michael W. Homer. Mormons in the Piazzza: A History of The Latter-day Saints in Italy (Provo and Salt Lake City: Deseret Book and the Brigham Young University Religious Studies Center, 2017), p. 373. ^ "First Presidency Reorganized - ensign". www.lds.org. ^ Deseret News Church Almanac, 2010 Edition, p. 197-198. ^ Oaks, Dallin H. (October 1987). "Recent Events Involving Church History and Forged Documents". Ensign. ^ E.g., The Mormon Murders; Salamander: The Story of the Mormon Forgery Murders; Victims: The LDS Church and the Mark Hofmann Case; and Tracking the White Salamander. ^ Tracy, Dawn (April 29, 1985). "Historical Letter Disappears". Salt Lake Tribune. ^ Turley, Richard E., Jr. (1992). Victims: The LDS Church and the Mark Hofmann Case. Urbana, Ill.: University of Illinois Press. p. 75. ISBN 9780252018855. OCLC 924973460. Hinckley gave the document to Gibbons, who, as he did with the Bullock-Young document, placed it in the First Presidency's vault for safekeeping. ^ Turley, Richard E., Jr. (1992). Victims: The LDS Church and the Mark Hofmann Case. Urbana, Ill.: University of Illinois Press. p. 222. ISBN 9780252018855. OCLC 924973460. During his interview with investigators, however, Hinckley said he negotiated the purchase of the Stowell letter directly from Hofmann for fifteen thousand dollars after it had been authenticated in New York by Charles Hamilton. ^ The Mormon Murders, p. 138. ^ Allan D. Roberts, "The Truth is the Most Important Thing: A Look at Mark W. Hofmann, the Mormon Salamander Man"|quote="Hermann's Stowell goldigging letter once believed to be the earliest Joseph Smith holograph, was purchased directly by LDS First Counselor Gordon B. Hinckley with $15,000 of church funds. In his deposition Hofmann said that he met with Hinckley three times before selling him the letter, and assuring him there were no copies. Hofmann said that Hinckley told him that only top church leaders would know of its existence"
^ The Mormon Murders, p. 210.|quote=" Both the church news release and Cahills letter carefully avoided mentioning that the Stowell document had been sitting in the First Presidency vault for two years." ^ Turley, Richard E., Jr. (1992). Victims: The LDS Church and the Mark Hofmann Case. Urbana, Ill.: University of Illinois Press. p. 98. ISBN 9780252018855. OCLC 924973460. Around March 1985, members of the Mormon History Association began receiving copies of the most recent issue of the Journal of Mormon History, published annually by the association. The issue included a book review by Marvin S. Hill, professor of history at Brigham Young University, in which he referred both to the Stowell and salamander letters and the discussion they had evoked on money-digging. ^ The Mormon Murders, p. 209 |quote=" Hinckley couldn't have been surprised by speculation about the document's existence. A purported transcript of the letter had been circulating in the underground for at least a year.... But Hinckley was trapped. With rumors flying, photocopies circulating, and the Los Angeles Times set to publish an extensive article (with a copy of the letter), he had no choice but to go public. On May 9, 1985, the Church released a statement by the First Presidency: "We have acquired a letter presumably written by Joseph Smith...."
^ Turley, Richard E., Jr. (1992). Victims: The LDS Church and the Mark Hofmann Case. Urbana, Ill.: University of Illinois Press. pp. 101–102. ISBN 9780252018855. OCLC 924973460. ^ Allan D. Roberts, "The Truth is the Most Important Thing: A Look at Mark W. Hofmann, the Mormon Salamander Man". ^ "Salt Lake Tabernacle Reopens". MormonNewsroom.org. LDS Church. March 31, 2007. ^ Graham, Judith. "Listening Carefully to Voice Changes". ^ One of these was the Apia Samoa Temple, originally dedicated by Hinckley in 1983 but destroyed in an accidental fire in 2003. ^ Fidel, Steve (28 January 2008). "Students honor Pres. Hinckley with white shirts, ties and dresses". Dew, Sheri L. (1996). Go Forward with Faith: The Biography of Gordon B. Hinckley. Salt Lake City, Utah: Deseret Book. ISBN 1-57345-165-7. McCune, George M. (1996). Gordon B. Hinckley: Shoulder For The Lord. Salt Lake City, Utah: Hawkes Publishing. ISBN 0-89036-583-0. Garff, Melinda T. (1998). Gordon B. Hinckley: Fifteenth President of the Church. Salt Lake City, Utah: Bookcraft. ISBN 1-57008-534-X. Wikimedia Commons has media related to Gordon B. Hinckley.